Wear an EPA-registered insect repellent containing DEET, picaridin, oil of lemon eucalyptus or IR 3535. Insect repellent is safe and effective for children and pregnant women, too. Always apply according to label instructions. If using sunscreen, apply sunscreen first and then repellent. Dress to protect. Cover exposed skin by wearing loose-fitting, light-colored long-sleeved shirts and pants. For extra protection, treat clothing with permethrin or purchase permethrin-treated clothing and gear. Never apply permethrin on skin and always follow label instructions. Keep mosquitoes out of your home. Keep doors and windows closed. Make sure screens are in good repair. Use air-conditioning when available. Why Wage Battle Against Mosquitoes? Besides the unpleasant and itchy result of bites, West Nile Virus is found in mosquitoes in Northern Virginia every year and can cause symptoms such as fever, headache, body aches, joint pain and rash. Anyone traveling to areas where Zika is active are at risk of returning home infected with the virus. Only about one in five people with Zika develop symptoms, however pregnant women and women who might become pregnant should be careful not to get Zika because it can cause birth defects. Asian tiger mosquitoes, which can spread West Nile and Zika viruses, lay their eggs and develop in water-holding containers. 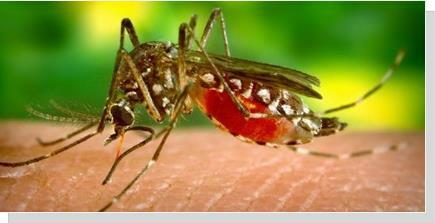 Asian tiger mosquitoes do not live in ditches, creeks, ponds or lakes. How Your Health Department Can Help: To have a Fairfax County Health Department representative give a brief overview of mosquito control at a homeowner or condo association meeting, call 703-246-8428, TTY 711, or email HDZika@fairfaxcounty.gov. Health Department staff can also do a yard inspection to help find and eliminate sources of mosquitoes on your property — just call 703-246-8931, TTY 711, or email FightTheBite@fairfaxcounty.gov to schedule an appointment. The Health Department does not routinely spray for mosquitoes and does not spray for nuisance mosquitoes. However, adult mosquito control will be considered if human or mosquito surveillance indicates a significant threat to public health.